Women's association in Tendo, members of a city council and JA (farmers cooperation) are connected with each other, they established "Tendo marriage promotion conference" on Friday, August 11. They are often approached with consultation that "Is not there a good person as a marriage partner?". Therefore they organized it to exchange information each other. Tendo city office established a marriage consultation place at the first floor of a city hall from June. In future, they will cooperate with this consultation place and push forward their enterprise. According to the national census in 1995 (7 of Japanese Heisei era), a single rate of men over 15 years old is 32.1% and one of women is 24.0%. A single rate of 30's is 25% in Tendo. When we compare it with a number of national census, there is not so much difference, I think. The Japanese public opinion poll society, they did a questionnaire about merger of towns and villages for the whole country. As a result, 56% of people expressed "Agreement". This number exceeded greatly 30% of "Objection". Most reason to agree a merging self-governing bodies is to be able to reduce many variety of expenses (ex. labor costs). On the other hand, main opinions to object to merger are that personality and a characteristic of an area are lost, it is hard to become reflect an opinion of inhabitants, etc. Tendo city office, they have done a similar questionnaire on the other day. However, it was reversed as a result of this time, the people who objected to merger exceeded the majority. I think that there is a same situation to be different from such "mean" of this time in whole country. And about the expense reduction that is the main opinion that merger is agreeable, I think that there is a method to reduce a cost more in present situation, for example, to consign the business to a private enterprise positively. There is the Tendo spa cooperation which is organized in hotels and Ryokan(Japanese styled hotel) at Tendo spa. And they decided to begin a campaign that a tone of a music box sounds through whole Tendo spa. They were open "Tendo Automatic Musical Instruments" in the south of Tendo spa on 10th in June this year. Tendo spa cooperation considered this to be an opportunity and started a action to become a new Tendo spa. They will have a plan to broadcast a tone of a music box from 12 loud speakers set up in Tendo spa in the evening when a lot of lodging visitors check in at and early in the morning to check out of. They begin a test from today and broadcast it in each hotel from September 1. Same as the time of "Ningen Shogi" in April, there is the jinx that it is rainy on a day of either by all means. And it has rained this year, too. Lightning occasionally strikes it, the rain that it seemed to have upset a bucket continued from afternoon to the evening. 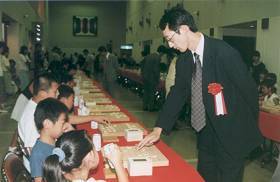 They changed an event place by this weather, the shogi Hyakumen Zashi was done in a community hall next to the city hall. 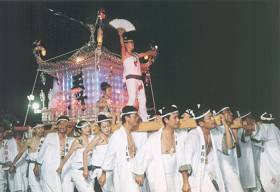 However, this rain stops in the evening, we were able to hold the shogi mikoshi parades outdoor. I was worried that that many spectators didn't want to go to the festival because of that rainy influence, but a lot of spectators flocked to a route. 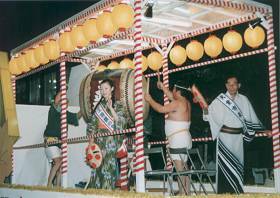 There are a lot of participation by the area whole in a shogi Mikoshi parade. Therefore, many cheering parties of a participant gathered, I think. 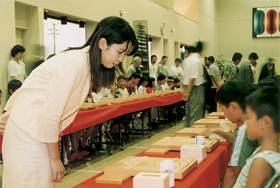 Many paries took part in at the parade of Shogi Mikoshi, not only old traditional type but also new create type. Left picture is a Nakazato Higashi-machi society. 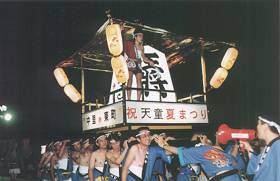 "The Tendo Summer Festival" began today that had the 10th time this year. 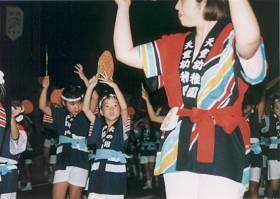 The first day(August 8), they held a flower hat dance, marching parade of students, etc. 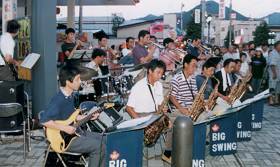 In this September, we have the Yamagata international jazz festival in Tendo "Jazz Meeting 2000". To promote this event, a local jazz band "Big Swing Face" had a special recital before the parade of flower hat dance. The number of participation groups to a flower hat dance of this year, it was a 23 groups(amounted to 1,849 people) that 3 groups increased than the last year. A lot of people danced all at once. In the parade the most standing out group is the "Yomoyamakai", a nation culture circle. 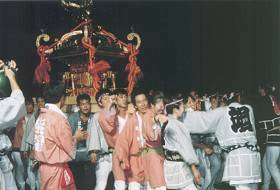 In the first on the list "The Yamagata Flower Hat Dance Festival" that is done from August 5 to August 7, they participate in a flower hat dance festival done in each place in Yamagata prefecture. 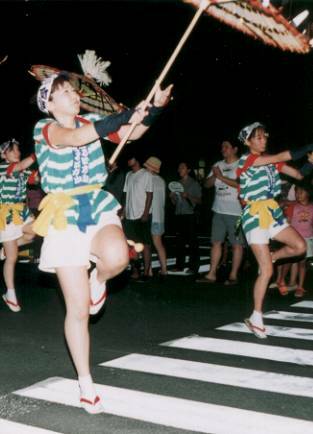 The dance of them originate from the dance in Obanazawa area. It is a characteristic to turn a flower hat showy. Many spectators were amazed and cheered up them because we have no time to see that kind of a flower hat dance around here. We had a special performance of a local jazz band "Big Wing Face" before the parade of flower hat dance. At the Nishi-Numata remains in Kurazou district, they discovered a sign of a rice field till now. And in addition to this, a ridge and a wooden irrigation sign for agriculture water were discovered afresh. They say that this is a precious document to show that the basics of rice growing technology were already completed in those days. # A ridge : The thing which we heaped up soil between one rice field and another rice field, and turned into a border. # Irrigation : Draw water into the fields. Width of a ridge is larger than a current rice field, there seem to be approximately 150cm from 50cm. Furthermore, the current rice field is a rectangle, therefore a ridge is made on the straight, too. However, the track of a discovered ridge wound. It is peculiar. And the wooden irrigation was discovered in the form that they hit a stake to a river and throw several woods on there to stop a river. It is supposed that they stopped a river and drew water into a rice field of circumference. Nishi-Numata remains are very important when they know a figure of former Tohoku region than 712 years when Dewa country was organized (5 of Japanese Wado era). They decided that it was a historic spot of country appointment in 1987 (62 of Japanese Showa era). They have a briefing session at the actual place from 2:00 p.m. on Thursday, August 10. In the summer vacation, would you try to indulge yourself in ancient times dream ?